Want to propose someone? Or planning to give an love message to your beloved? Book Amor Cake right now. 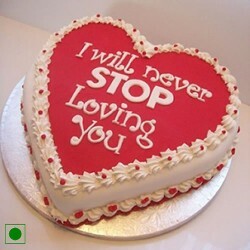 You can customize your message on this cake. and send it to your other half. This Heart Shape beautiful cake can be prepared in 1 kg Pure Eggless with any flavour of your choice. You can choose the flavour of your choice from delivery options. If you wish you can also added weight to the cake from delivery options. Can be delivered same day in Jaipur and other major cities of Rajasthan.